From Townsend Letter for Doctors and Patients, 2/1/04 by Paul Yanick, Jr. Millions rely on painkillers in order to mute the agony of slipped discs, deteriorating joints and prolonged inflammation. Cox-2 inhibitors and pain relievers (including the non-steroidal anti-inflammatory OTC medications) are consistently top sellers in the multi-billion dollar market. Most alternative practitioners are familiar with histidine as an amino acid but few are aware of its vital function in blocking inflammatory cascades, counteracting the negative effects of stress-induced cortisol overload, and supporting digestion and immune function. Histidine--a neurotransmitter released during an immune response--has global functions with the unique ability to shift fatty acid metabolism away from pro-inflammatory mediators. 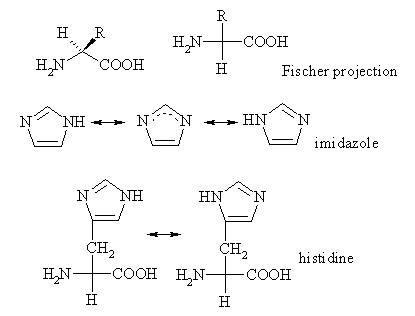 Although biochemists are not sure how histidine is synthesized by the body, they are certain that histidine is essential for zinc absorption and transport to the tissues. One study documented how histidine supplementation stimulated growth by enhancing zinc uptake, which in turn, thickened the growth plate in the bone. (1) Other researchers have documented how histidine is a myelin basis protein and when it is bound to organic zinc, it provides nerve-insulating protection. (2), (3) Could supplementation with this metalloprotein provide effective treatment in correcting deficiency states and removing heavy metals that are implicated in multiple sclerosis, Alzhiemer's disease and Parkinson's disease as causative factors? Excess cortisol from stressors (emotional, microbial, xenoestrogens, endotoxins, dental focal toxicosis, etc) blocks the action of the enzyme, histidine decarboxylase which slows the degradation of histidine and prevents conversion to histamine. An impaired ability in metabolizing (changing) histamine molecule into a H2 receptor agonist causes a buildup of the H1 receptor type and inadequate production of the H2 receptor type. The result: food sensitivities, allergies, and MCS with histamine not broken down fast enough by the enzymes, histaminase and imidazole N-methyl-transferase. Isn't this why so many people take antihistamines to get relief from allergens or from chemical sensitivities? In our clinical experience, nickel toxicity is the most powerful inhibitor of these enzymes. And, since histidine is the most powerful chelator of nickel and heavy metals, it makes sense that a deficiency of zinc and histidine will cause ongoing metal-induced toxicity and oxidative stress, triggering progressive neurodegeneration. (7) Prolonged inflammation, then, becomes the end result of a deficiency of histidine or of long-term accumulations of nickel in the body that interfere with the enzymatic breakdown of histamine. With histidine and zinc depleted, the body's anti-inflammatory defenses are weak. Research has shown that individuals benefiting from Cox-2 inhibitors include those with chronic and acute inflammation, people with colon cancer, breast cancer, esophageal cancer, bladder cancer, skin cancer, and Alzheimer's disease. (8-10) The side effects of Cox-2 inhibitors are inhibition of Cox-1 enzymes with a resultant wide array of gastrointestinal symptoms. Plus, Cox-2 inhibitors do not block a pro-inflammatory metabolite of arachidonic acid, leucotriene B(4). Gamma-linolenic acid (GLA) is precursor to dihommogamma-linolenic acid (DGLA). DGLA is converted to arachidonic acid (AA) through the enzyme action of delta-5-desaturase (D-5-D) which, in turn, triggers the production of pro-inflammatory leukotrienes. Yet, when histidine is combined with GLA and zinc, this nutritional compound becomes a powerful leukotriene synthesis inhibitor, inhibiting D-5-D enzyme activity. This novel histidine-GLA-zinc complex--operating via known biochemical pathways of H2 histamine receptors--provides the safest and most effective anti-inflammatory actions in the body. When utilized, it can shift fatty acid metabolism away from pro-inflammatory mediators. In other words, it prevents the conversion of GLA into DGLA thus, avoiding the whirlpool of pro-inflammatory mediators that underlie prolonged inflammation. This is the reason why Omega-6 essential fatty acids can actually spin the wheels of inflammation faster and deeper into the organism. Even flax, borage, black current seed oil, evening primrose oil are not effective clinically when there is a histidine, GLA, or zinc deficiency. Simply stated, without these nutrients present, these essential fatty acids will propel the body deeper and deeper into inflammation and pain. Since D-5-D has hierarchy over Cox-2 enzymes, Omega-3 oils, consisting of alpha linolenic acid (ALA), docosahexaenoic acid (DHA) and eicosapentaenoic acid (EPA), found predominantly in fish, may be used with some degree of success to counter inflammation. And, they are the better clinical choice over Omega-6 in histidine and zinc deficient patients. But, these positive effects are short-lived and only minor relief will be reported by those patients in pain. The same is true for most commercial types of zinc supplementation. No matter how you supplement zinc, its transport and utilization at the cellular level will be minimal when it's not organic zinc and when histidine is deficient. When you realize that zinc is a constituent of over 100 enzymes, insulin, and lymphocytes, it is obvious how such a common deficiency can translate into so many complex, treatment-resistant conditions. H2 histamine receptors activate the pineal gland to produce melatonin and cyclic AMP, vital factors in maintaining the blood-brain barrier, leaving the brain and nervous system vulnerable to damaging toxins, substances, and organisms in the blood. And, it is well known that the blood-brain barrier is damaged in MS patients and pineal gland atrophy is pronounced. Melatonin is also necessary for the productive stage of sleep called Rapid Eye Movement sleep (REM) where the body does the majority of its repair work. But, most importantly, melatonin is critical for the metabolism (breakdown and utilization) of fats at the H2 receptor. Remember, the pineal gland is the only part of the brain's anatomy where fats can be metabolized by lipoxygenation, a process that does not generate lipid peroxides (other regions of the brain can only metabolize fats by lipid peroxidation with the generation of lipid peroxides). Lipid peroxides damage nerve cells and the myelin producing cells in the brain and spinal cord called oligodendrocytes. Besides the problem with excessive lipid peroxides, the myelin producing cells of the brain and spinal cord are further endangered because of the lack of cyclic AMP. Remember, H2 is major route the body uses to produce cyclic AMP, critical to maintain the structural integrity and health of the myelin in the brain and spinal cord. Moreover, since H2 regulates the immune system and cyclic AMP boosts T-cells and B-cells functions and increases the production of gastric acid and digestive enzymes, it becomes apparent why nutritional support of the body's anti-inflammatory and digestive functions is critical for optimal health. The use of catalytically-active organic zinc bound to non-GMO and food-grown histidine and non-oily GLA resulted in rapid correction of zinc deficiencies with significant anti-inflammatory effects and enhancement of the immune response. Rather than using inorganic and ionically-bound zinc (a common nutritional practice), our research has documented that an organic, non-covalent, metalloprotein matrix with GLA yields outstanding clinical results. The fusion of these three organic ingredients is done via flexoelectric technology (11) that synchronizes quantum fluctuations and creates an amplified crystalline resonant field to propel these nutrients deep within the cells of the body, thereby upregulating nutrient uptake. Flexoelectric technology can also be employed therapeutically to enhance electron transfer functions and stabilize molecular defenses to reduce oxidative stress in the sub-molecular realm where homeopathy has already shown us powerful methodologies to control and regulate the body. Reestablishing cellular resonance in a world of neverending EMF stress can be accomplished with flexoelectric technology which removes a muscle-organ proprioceptive block (painful or spastic muscle) to upregulate nutrient uptake. (11) Moreover, with flexoelectric technology, the pineal gland can be resonated to metabolize fat without the negative effects of lipid peroxidation. Hence, repair and regeneration routines can be optimized as GLA is metabolized into the body's anti-inflammatory pathways. It's important to remember that when the nutritional status of the host is poor, the functioning of the host immune system is poor. With prolonged inflammation, immunological unresponsiveness leads to increased susceptibility of infectious disease. But, when we consider the effect of a nutritional deficiency on the pathogen itself we find that a nutritional lack causes a virulent strain to become more virulent as the virus itself aggressively proliferates when there is active inflammation. Aspergillus versicolor is an especially dangerous and life threatening common household fungi because it produces airborne mycotoxins that lead to serious respiratory distress, flu-like symptoms, lethal lung infections, bleeding in the lungs with blood being coughed out as large, big clots. In summary, enhancing and nourishing the body's own anti-inflammatory mechanisms is the wise course compared with taking addictive and potentially harmful painkillers or Cox-2 inhibitors that are only partially effective. The brain is a chemical factory that produces neurotransmitters. The pineal gland plays an indispensable role in fat metabolism. The brain can block an organ with a specific left-right muscle pattern--as taught at Quantum Repatterning Technique Seminars--that must be repatterned for the weak organ to be strengthened and nourished. To repattern the neuromuscular status, we avoid the energy-depleting effects of low level lasers and use flexoelectric technology which enhances the human energy field by removing chaos from the DNA-meridian interface of innate communication. (11) Finally, prolonged inflammation, along with a deficiency of histidine and zinc, lies at the root of many serious degenerative disorders. Cyclic AMP is necessary for every cell to function and when the body's ability to make cyclic AMP through the H2 system is impaired, the body breaks down ATP to produce cyclic AMP. Indeed, this drop in ATP could be the underlying factor in chronic fatigue syndrome or the tremendous fatigue that MS sufferers experience. (1.) Van Wouwe JP et al: Growth characteristics in laboratory animals fed zinc-deficient, copper-deficient of histidine supplemented diets. 1996. Biol Trace Elem Res 55:71-7. (2.) Zabnow, CA et al: Glucocorticoid hormones downregulate histadine decarbolylse mRNA and enzyme activity in rat lung. 1988. Am J Physiol 275:407-13. (3.) Tsang D et al. Myelin basic protein is a zinc-binding protein in brain: possible role in myelin compaction. 1997 Neurochem Res 22(7):811-9. (4.) Advances Neurol, 1993; 60: 282-87. (5.) Biochem Phys 1995; 1271: 265-74. (6.) Horrobin DF et al. The nutritional regulation of T lymphocyte function. 1979 Med Hypothesis, 5(9):969-85. (7.) Quinn PJ et al. Carnosine: its properties, functions and therapeutic applications. Mol Aspects Med 1992 13(5):379-44. (8.) Dannhardt G, Kiefer W. Cyclooxygenase inhibitors: Current status and future prospects. Eur J Med Chem 2001 Feb;36(2):109-26. (9.) Lynch PM. COX-2 inhibition in clinical cancer prevention. Oncology (Huntingt) 2001 Mar;15(3 Suppl 5):21-6. (10.) MacKenzie IR, Munoz DG. Non-steroidal anti-inflammatory drug use and Alzheimer-type pathology in aging. Neurology 1998;50:986-90. (11.) Yanick, P. The Quantum Naturopath: Activating Quantum Healing with New Flexoelectric Technology. 2003 Townsend letter for Doctors & Patients, 154-6. (12.) Yanick, P. Mycotoxicosis: A new emerging co-factor in Alzheimer's environmental illness and treatment-resistant syndromes.2002 Townsend Letter for Doctors & Patients, 154-6. (13.) Berina V Mycotoxins. 1981 PCS Environmental Health Criteria. 1990. WHO. (14.) Sweeney M, Dobson A Molecular Biology of Mycotoxins Biosynthesis FEMS Microbiology Letters 1999, 175:149-63. (15.) Smith JE, Moss MO Mycotoxins, formation, analysis, and significance. 1985. Chichester: John Wiley. (16.) Davidoff A Psychogenic origins of Multiple Chemical Sensitivity Syndrome Arch of Environ Health. 1994 5:316-25. (17.) Dunn A et al. Endotoxin-induced activation of Cerebral Catecholamine and Serotonin Metabolism: Comparison with Interleukin-1. 1992. J of Pharmacology & Exp Therapy. (18.) Hendry M, Cole, E A Review of Mycotoxins in Indoor Air. J of Toxicology and Environmental Health. 1993, 38:183-98. (19.) Costantini AV The Fungal/Mycotoxin Etiology of Atherosclerosis and Hyperlipidemia. 1993. The Eleventh International Symposium on Man and His Environment in Health and Disease.